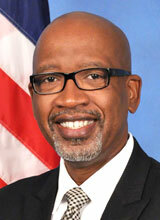 Commissioner Welch was born in St. Petersburg and attended local schools, graduating from Lakewood Senior High School. He holds a B.A. degree in Accounting from the University of South Florida, and a Master’s Degree in Business Administration from Florida A&M University. Commissioner Welch’s professional work experience includes 14 years in Accounting, Information Technology, and Financial Systems Administration with Florida Power Corporation (now Duke Energy), and more than 20 years of entrepreneurial experience as Technology Manager for Welch Accounting & Tax Services, a family-owned business. In November 2000, he was elected to the Pinellas County Board of County Commissioners, representing District 7. Commissioner Welch was re-elected to the Pinellas County Commission in 2004, 2008, 2012, and 2016. Commissioner Welch served as Chair of the County Commission in 2006, 2013 and 2018. He also served at the state level as the 1st and 2nd Vice President of the Florida Association of Counties, Urban Caucus Co-Chair, and Chair of the Finance, Transportation and Administration committee. In addition to his duties as a Pinellas County Commissioner, Commissioner Welch has also served as Chairman of the Pinellas Suncoast Transit Authority (PSTA), Pinellas County Tourism Development Council Chair, Pinellas County Business Technology Services Board Chair, Pinellas Economic Development Council Chair, Pinellas Metropolitan Planning Organization/Forward Pinellas, Advisory Committee for Pinellas Transportation, Pinellas Health & Human Services Coordinating Council, and other local, state and national organizations. Commissioner Welch has focused his efforts on diverse community issues, including community and economic development, housing, transportation, poverty reduction and public safety. Prior to his election to the County Commission, Commissioner Welch was appointed by Governor Jeb Bush to the St. Petersburg Junior College Board of Trustees. Ken and his wife, Donna, have 2 daughters.